This notion may be anathema to Islanders fans, but it is in the team’s best interests to lose tonight in Madison Square Garden. Heck, it’s in the Rangers’ best interests, too. The players won’t be shooting on their own goalie, of course, and the hometown fans won’t cheer when the visiting team scores, but whoever emerges from this game with fewer points is the undoubted winner. Look no further than the Pittsburgh Penguins for an explanation. Having all but locked up second place in the Metropolitan Division, the Penguins, winners of seven straight and 13 of 14, await the Division’s third-place finisher in the first round of the playoffs. To strive for that position is to skate off a cliff. Depending on how the Isles fare in their final three games – and respecting the unpredictability of hockey – they’ll finish in one of four spots. Might they finish 0-3 while the Flyers finish 3-0, enabling Philadelphia to leapfrog them in the Wild Card standings? I suppose. And might they win out while the Penguins lose their last two, vaulting the Isles to second place in the Metropolitan? Sure, I guess. But really, for the Islanders, it’s down to two spots. They can either slide into third place in the Metro and invite a first-round matchup with the scalding-hot Penguins, or hold down the first Wild Card berth and gear up for the young Panthers. Either way, the Islanders will be on the road to open the playoffs, so the question for their fans is a simple one: would you rather play the Penguins or the Panthers? With due respect to the Panthers, that seems like a painfully obvious answer. The Penguins’ winning steak has heightened their reputation of late, but in terms of “process,” of systematic execution, they’ve been one of the NHL’s best teams for most of the season. Their 53 percent even-strength Corsi is the best in the Eastern Conference and second overall, and their plus-43 goal differential is second only to the Capitals. In many ways, their current surge was a long time coming. The Panthers, on the other hand, have outperformed their underlying statistics ever since embarking on that 12-game winning streak in the middle of December. Their 48.7 percent even-strength Corsi (11th in the East, 20th overall) speaks to a team that’s chasing the puck more often than controlling it, and their PDO of 102 (2nd in the East, 2nd in the overall) implies the Panthers are as lucky as they are good. If this were a prom picture, the Panthers would need a step stool or some seriously-high heels to measure up with the Penguins. There are injury concerns for Pittsburgh that bear mention. Evgeni Malkin (upper body) is sidelined until the middle of May, and Marc-Andre Fleury (concussion) is a question mark for the start of the playoffs. But since Malkin went down on March 12, the Penguins have won 12 of 13. And while Fleury’s status remains up in the air, it’s quite possible the team is simply erring on the side of caution. Furthermore, the Panthers aren’t an injury-free team themselves. 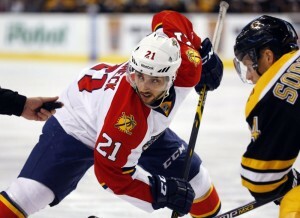 Vincent Trocheck, the team’s best forward for the past month, will likely miss the first week of the playoffs. And defensemen Erik Gudbranson and Willie Mitchell, both battling concussion symptoms, remain on the shelf. The Isles haven’t fared particularly well against either team this season. They finished 1-2-1 against the Penguins – including a 5-0 spanking last weekend – and 1-1-1 against the Panthers. With little past success to lean on either way, the Isles are best served by playing the more vulnerable team. Right now, that’s the Panthers. So that’s what’s left to be decided in the Islanders’ season. If they win tonight to pull even with the Rangers, they’ll inch closer to a deadly encounter in the first-round of the playoffs. If they lose, leaving the Penguins for the Blueshirts, they’ll back away from the fire and likely secure a series with a lesser team. Falling short in Madison Square Garden would never make more sense.